Going on a first date is both scary and exhilarating, and you want to ensure you look your best to make a great impression, without trying too hard and completely missing the bar. So, how do you find that perfect balance? When going on a first date, one of the main goals is to look as chic as possible, without looking as though you’ve tried – which is something most women have already mastered a thousand times over. A cute LBD with a pair of booties, a skater dress paired with a cropped leather jacket, an elegant maxi dress, or a pair of jeans with a sharp tailored blazer are all great options for a first date. But before choosing your outfit, there are two things to remember, 1) where you are going and 2) what not to wear. If you’re going hiking (which would be an interesting first date) you definitely don’t want to turn up in a dress, or if you are going to a smart restaurant jeans may be out of the question. So there are two things to consider: are you going on a low-key date, or is it a more formal occasion? There are also a few things you should always avoid when on a first date, and we’ve chosen to keep this list as simple and straightforward as possible. Firstly, avoid anything too revealing, as that can send off the complete wrong impression. We’re loving the plunging neckline trend, but we recommend you opt for something a little more refined on the first date, the same goes for your hemline. But just because we suggest you wear less-revealing clothing does not mean we are telling you to hide your figure in oversized, baggy clothing like sweatpants and tracksuits. Opt for well-fitted clothing instead. This may be a surprising one, but high-waisted jeans are another item of clothing that you shouldn’t wear on a first date, the sad fact is that most men just don’t like them – because they probably don’t understand the beauty of them. Animal print is a trend that, in our opinion, should have died a long time ago. Unfortunately the print comes with a bad rap, and is known for looking tacky instead of timeless: so all leopard, cheetah, zebra and other animal-inspired prints should be left at home. Also, glitter and sequins. Lastly, shoes and makeup are just as important as your outfit. Pick shoes that you will feel comfortable in, and be able to walk around in – no matter how great the 12 inch heels may look. And always keep your makeup as natural as possible. Style is not the only thing that plays in when choosing your outfit, it’s also important to consider the colours. 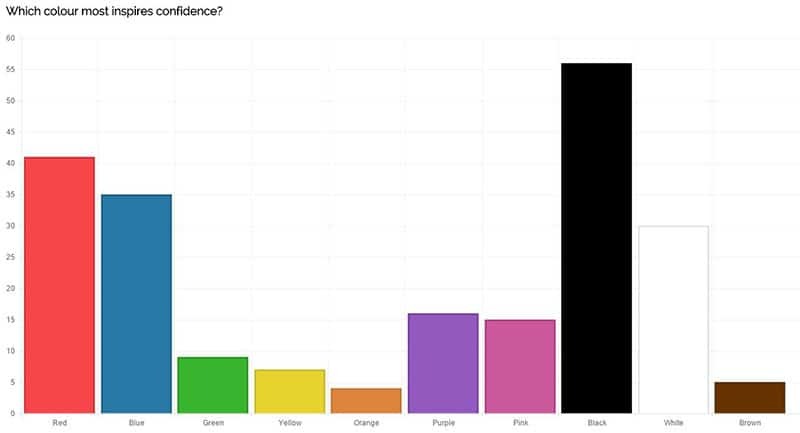 British company Buy T-Shirts Online conducted a survey using 1,000 people to understand how they perceive colour and whether they care about the way that others perceive them. The results were actually pretty surprising and one of the categories includes dressing for a first date – and if you’re a lover of classic, neutral tones you’ll be happy with the top result. 56% of respondents in the survey favoured black as a colour of confidence with 48% of women and 64% of men favouring it. Following black was red, blue, white, purple and pink, but very last on the list were brown with only 5%, and orange with 4%. What this says for all those fashion lovers out there, is when it comes to first dates, orange is not the new black, and leave all your brown, sandy tones safe at home in your closet (for at least date two). To play it safe, and look effortlessly chic and glamourous, we recommend a monochromatic black and white colour scheme. These colours work so well together and are bound to have you feeling and looking fantastic.